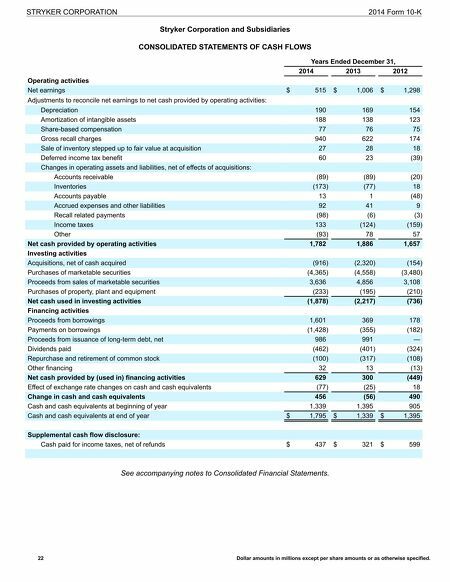 Stryker Corporation and Subsidiaries CONSOLIDATED STATEMENTS OF SHAREHOLDERS' EQUITY Common Stock Additional Paid-In Capital Retained Earnings Accumulated Other Comprehensive Income (Loss) Total Balances at January 1, 2012 $ 38 $ 1,022 $ 6,479 $ 144 $ 7,683 Net earnings 1,298 1,298 Other comprehensive loss (15 ) (15 ) Issuance of 1.5 million shares of common stock under stock option and benefit plans, including $28 excess income tax benefit 7 7 Repurchase and retirement of 2.1 million shares of common stock (6 ) (102 ) (108 ) Share-based compensation 75 75 Cash dividends declared of $0.9025 per share of common stock (343 ) (343 ) Balances at December 31, 2012 38 1,098 7,332 129 8,597 Net earnings 1,006 1,006 Other comprehensive income 103 103 Issuance of 2.1 million shares of common stock under stock option and benefit plans, including $47 excess income tax benefit (1 ) (1 ) Repurchase and retirement of 4.8 million shares of common stock (13 ) (304 ) (317 ) Share-based compensation 76 76 Cash dividends declared of $1.10 per share of common stock (417 ) (417 ) Balances at December 31, 2013 38 1,160 7,617 232 9,047 Net earnings 515 515 Other comprehensive loss (486 ) (486 ) Issuance of 2.2 million shares of common stock under stock option and benefit plans, including $59 excess income tax benefit 19 19 Repurchase and retirement of 1.3 million shares of common stock (4 ) (96 ) (100 ) Share-based compensation 77 77 Cash dividends declared of $1.26 per share of common stock (477 ) (477 ) Balances at December 31, 2014 $ 38 $ 1,252 $ 7,559 $ (254 ) $ 8,595 See accompanying notes to Consolidated Financial Statements. 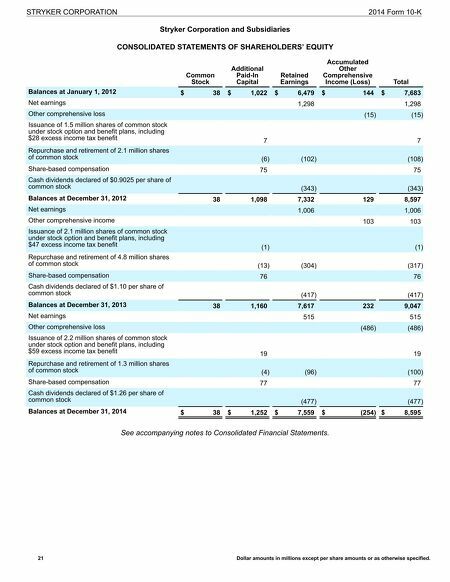 STRYKER CORPORATION 2014 Form 10-K 21 Dollar amounts in millions except per share amounts or as otherwise specified. Item 12. Security Ownership of Certain Beneficial Owners, etc.